Sometimes all you need is a little bit of pop to pull an outfit all together. It could be as simple as a pair of shoes . . .
Or a purse . . .
Ok, maybe tied around the waist is more fun . . .
And little bright flat sandals . . . Either way, just that little bit of pop sure made this outfit my happy place for the day. Outfit details: this fun skirt came from the wonderful Mindy Mae’s Market, great little shop . . . follow their instagram for daily updates, the shirt came from psiadoreyou.com another great site where some of your donations go to help childhood cancer. Linking up with Patti for visible Monday (last one for summer so be sure to pop over). And Cherie for shoe and tell. I love the ways you play with clothes, Trina! Those heeled sandals are fab. Thanks for sharing with Visible Monday, xo. Pop with panache! You look fantastic Trina! No favourites here…I love them all! Thank you Sue, and I’m getting so excited to meeting you. I need this outfit from head to toe! is that top and skirt a recent purchase? You look fab as always Trina! Yes, they are both new. The skirt is from MindyMae.com and the top is from psiadoreyou.com very fun and super affordable websites. Ohhhh how beautiful. I thought it was a dress but I read it is a top and a skirt. I love it and it could have been hanging in my closet. The shoes are those shoes I have drooled over before. Still in awe over them. And adding the bright jumper is a great idea. I like how you change the bags and the shoes. I would do the same. When I looked at your cute red sandals I thought: “See ?? Her feet are different from mine in flat shoes. She wears them so much better.” Your arche is probably higher or something as my feet are not big but they look like clown feet in flat shoes. Great photoshoot, great background. You are one funny lady, your feet are far from looking like clown feet. But I will admit, I do have a high arch so I can get away with wearing flats even if I’m on the short side, I still enjoy my flats (you get around so much quicker in life). My son says to tell you thanks because I actually had him take the pictures today since he’s home for the summer. Believe it or not my athletic son is quite the photographer, and he makes me laugh the entire time. Well, well, what unexpected skills that graduate of yours has. Brains, body, looks and creativity… We have an expression for that in The Netherlands but it is rather slang, so I won’t translate as on paper it “sounds” too coarse. Let’s just say that some people get all the talent in one big heap. Gorgeous! Those yellow shoes with red soles (Louboutin, are they?) are just drool worthy! 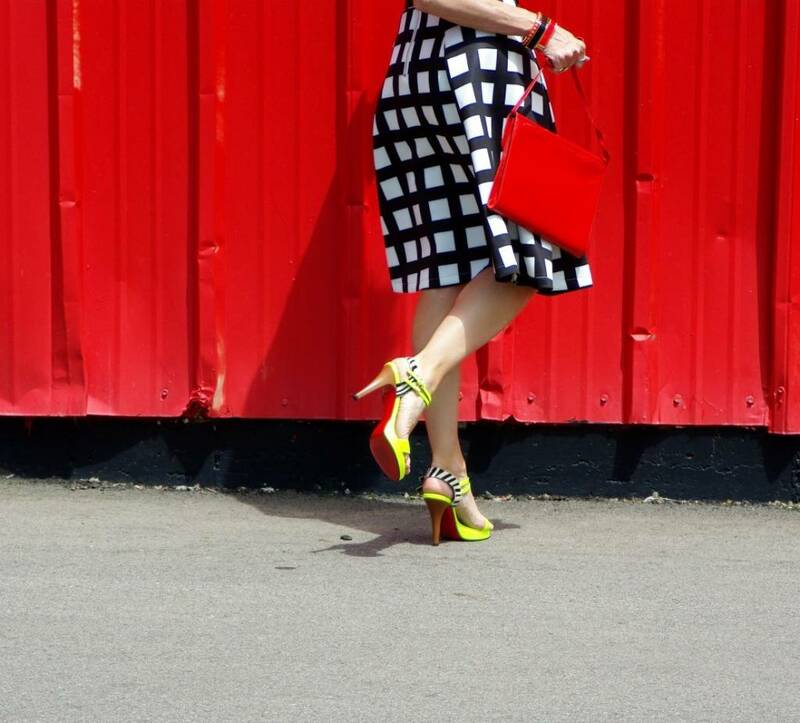 The contrasting red handbag adds extra ‘oomph!’ factor! I love both looks, even with the sandals! Thank you so very much, you are so sweet. 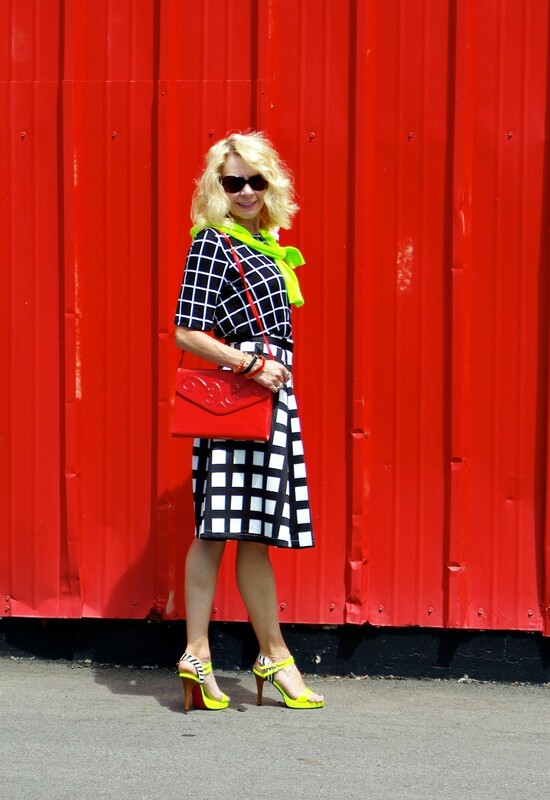 I love the pops of color against the monochrome palette…a very smart look indeed! Thank you Shellie and thanks for dropping by, its so nice to meet new bloggers. Love this modern chic look! Those sandals are fabulous! Thank you Alena and thanks for dropping by, can’t wait to go visit your blog as well. I love the look, Trina. The dress is cute, the combination of grid is precious. The fluorine touches on shoes and sweater are wonderful, the outfit wins light and attractive. Yay! Glad its a winner (lol). You may be surprised but its actually a skirt and top, totally separate pieces but I had a great time putting them together. Wow! What a bold creative outfit! I really love it against the red background. Thank you Suzanne, that’s a real compliment coming from such a creative dressing gal like you. love your ootd! pops of color are a must for summer. thanks, for sharing your viewpoint. you look divine in that adorable skirt. You look like you are having a blast! I really love this dress on you. I have kind of been looking for windowpane skirt etc. love the yellow and red, perfect pop! Now, if you could tell me where you bought that red bag? ! Thank you for hosting this fun party each week. My fun red bag I found at an antique store in Branson, MI last year, isn’t it a delightful little piece? The heels are lovely! I like how you’ve styled the outfit with different accessories!